"The Hardest Way to Make an Easy Living"
While some may have been celebrating Shakespeare's 442nd birthday this past week, others were toasting a more contemporary talent known as the "Brummie Bard," or Mike Skinner of The Streets. The Birmingham native has recently released the latest installment to his growing "chip-hop" folio -- "The Hardest Way to Make an Easy Living." Thick with his own take on garage/hip-hop, it meshes electronica with clever musings on daily life in an attempt to solidify his status as one of the UK's freshest artists. This being his third release, Skinner can now lay claim to a unique style that's instantly recognizable, a sound more pop than Dizzee Rascal and more hip than Chris Martin. Skinner is part of a lyrical tradition that stretches back through Ray Davies and Paul Weller and includes such contemporaries as Babyshambles' Pete Doherty and the Arctic Monkeys' Alex Turner. Rather than fall back on banal cliches or ape American mannerisms, these artists have used their dialects to celebrate locales uniquely their own. When Skinner released his debut "Original Pirate Material" in 2002, he was hailed as a new voice, akin to a street poet who articulated the youthful angst of those moments "when s--- goes pear-shaped" and the PlayStation breaks down. More chip shop than ghetto, he was soon branded a "chip-hopper," hit platinum in the U.K. and bagged a Mercury nomination for best new artist. His 2004 follow-up, "A Grand Don't Come For Free" was a remarkable leap forward, a concept album focusing on one day in the life of a "geezer" imbued with a panoramic rainbow of color. Like a chip shop James Joyce, Skinner found epiphanies in the minute particulars of a broken TV and empty beer cans. It also revealed more tender yearnings, earning him his first Number 1 with "Dry Your Eyes" and triple platinum status in the U.K.
"The Hardest Way" doesn't push the envelope or live up to the lyrical charm of its predecessors. 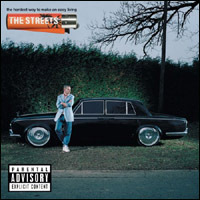 It's the sound of a local lad who has stepped away from the bus stop pictured on the cover of his previous album to lose himself in the high-life represented by the Rolls Royce on his latest. Predictably, he now finds himself in need of "a totally Trojan plan" to escape the trappings of fame. The opener, "Prangin' Out," is all about being strung out and adjusting to normal life after coming off a tour. "The rock and roll cliché walks in and then smacks me," says Skinner, while his falsetto on the chorus and soulful background vocals set the party vibe for the rest of the disc. The strength of "The Hardest Way" lies in the arrangements of the songs. Skinner makes free use of his familiar orchestral flourishes, melody, piano and even a little fuzz guitar to craft a more consistent pop sound than on his previous releases. While the instrumentation is still grounded in electronica, particularly drum machines, Skinner explores earthier, more soulful tones through the collaboration of guest vocalists Leo the Lion and Laura Vane. I try to do it myself"
Professor Skinner lets us know the next song -- "Momento Mori" -- is "latin and it says we must all die," while he gabs on about the insatiable indulgences of his very material life. But the cumulative effect of the handclaps and a nursery song refrain -- pounded out on what sounds like a toy piano -- just irritates. The first single, "When You Wasn't Famous" references "camera phones" and pop stars "who smoke crack," in a not too subtle nod to Doherty's tabloid scandal with Kate Moss. They're apt foils who make Skinner's lifestyle seem chaste by comparison. The album's second single -- "Never Went to Church" -- a ballad for his deceased father, recalls "Dry Your Eyes." The lyric is an intimate and touching evocation of Skinner's remembrances, but the tiredly familiar chord pattern and chorus cheapens the song's sincere sentiments. And you build on stars and maniacs shoot them"
Even though you shot him as well"
While there's enough on the "The Hardest Way" to satisfy fans, it's time for Skinner to ditch the famous labels and fancy lapels and come back home -- The Streets aren't the same without him.